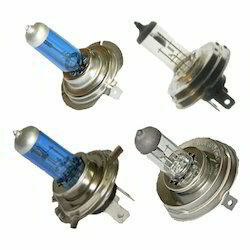 Wholesale Trader of a wide range of products which include halogen lamps and halogen bulbs. We are one of the top ranked manufacturers and suppliers of Halogen Lamps. These are incandescent bulbs with tungstein filament and filled with inert and halogen gases. Tungstein filament of the halogen bulb heats upto a certain temperature level to produce light. Halogen bulbs are electrical appliances and produce lights of multiple densities like ultraviolet, deep or infrared. Looking for Halogen Lamps ?